This Demonstration compares the speed of reciting colors of words that either match the meaning of the words or not. When colors do not match, the word's meaning interferes with saying the word's color (the Stroop effect). For example, showing the word "purple" with yellow letters makes it more difficult to name the color (yellow in this case) than showing the word "purple" with purple letters. The snapshots show one complete example: pressing the "start" button displays the colored words. 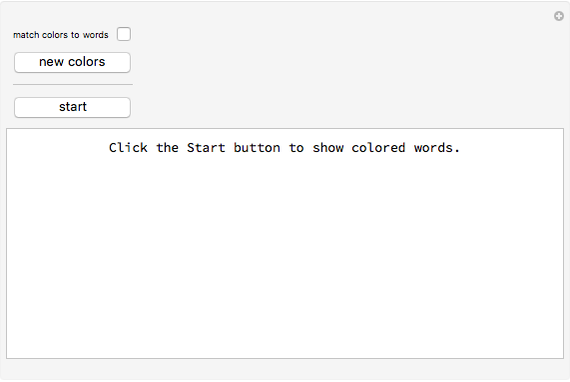 After saying the color of each word, pressing the "done" button displays the time since starting these words. The task is generally easier (i.e. 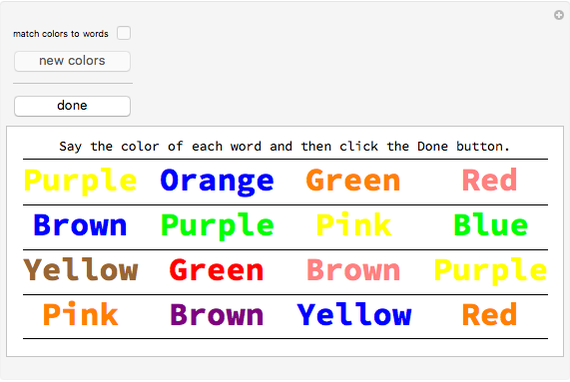 takes less time) when words and colors match (obtained by checking the "match colors to words" box). J. R. Stroop, "Studies of Interference in Serial Verbal Reactions," Journal of Experimental Psychology, 18(6), 1935 pp. 643–662. doi: 10.1037/h0054651. 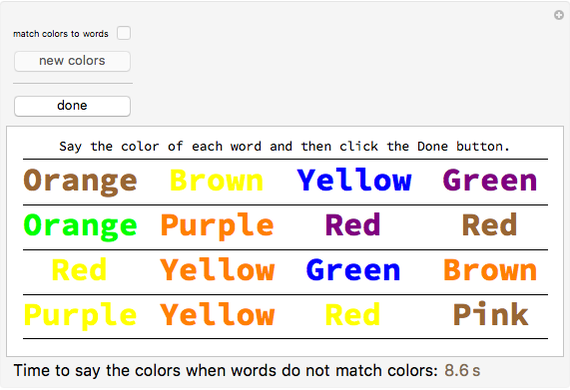 Tad Hogg "Stroop Effect: Reading Colored Words"